Cinematic Autopsy: Wanna Win A Copy Of "Skull World"? 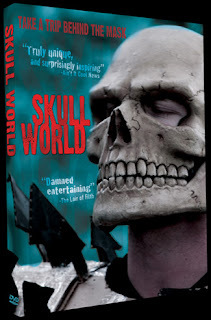 Wanna Win A Copy Of "Skull World"? IF YOU WANNA WIN A COPY OF THE AMAZING DOCUMENTARY "SKULL WORLD" ALL YOU NEED TO DO IS FOLLOW THE INSTRUCTIONS BELOW! 2. I NEED YOU TO SEND AN E-MAIL TO daniel@cinematicautopsy.com WITH THE SUBJECT LINE SAYING "SKULL WORLD CONTEST"
3. SIMPLY ANSWER THIS ONE QUESTION AND THE BEST 2 ANSWERS WIN A COPY OF "SKULL WORLD" DVD! QUESTION: IF YOU WERE TO DO BOX WARS WHAT WOULD YOUR CHARACTERS NAME BE AND WHAT WOULD HE/SHE LOOK LIKE? CONTEST ENDS JULY 14TH 2013!